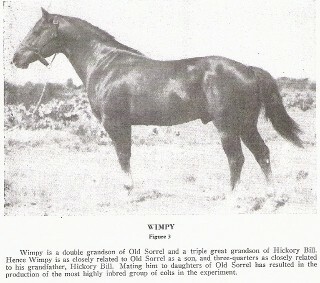 According to the AQHA's official stallion record, WIMPY WAS BORN IN '37, BUT PROOF HAS SHOWN THAT WIMPY WAS ACTUALLY BORN IN '35. The first American Quarter Horse to be registered, and an AQHA Foundation Sire. He is known as a Quarter Horse legend. Superior Halter Offspring, Superior Performance Offspring, AQHA Champion Offspring, ROM Performance Offspring, NCHA Money-earners.